This year is going to be special. I can feel it. 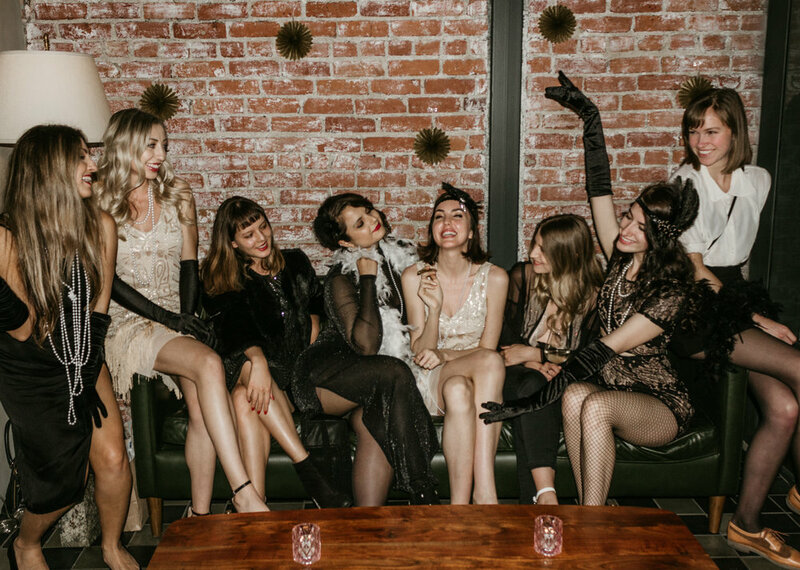 To start it off right, I decided to throw a party with class, style, and all my gal pals. 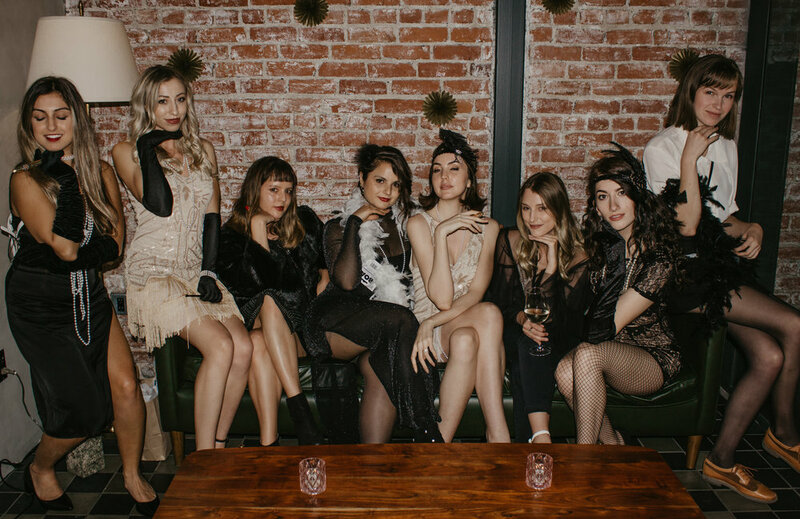 Of course, the weekend before Coachella is chaos in LA, so although all my gal pals couldn’t make it, we had the perfect little party group for conversations. I started the planning by partnering with the French/Moroccan restaurant Massilia in Santa Monica. I was confident that the party would go without a hitch because their service is phenomenal. 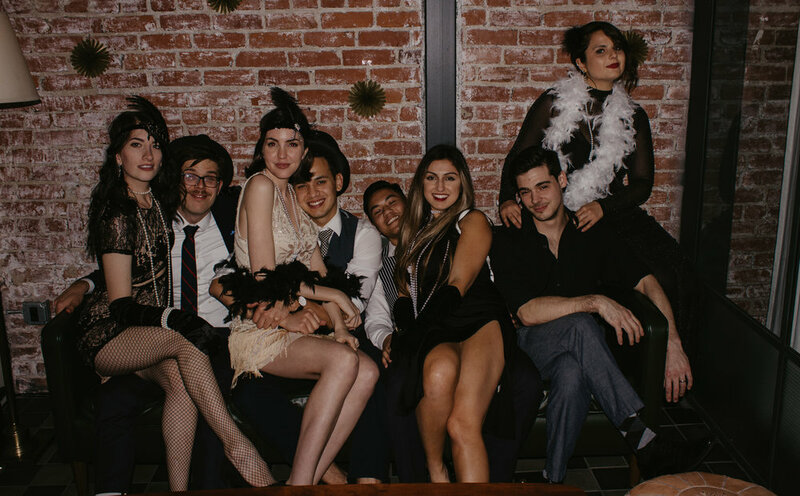 I was itching to try a 1920’s themed murder mystery party, which I purchased from My Murder Mystery Party. 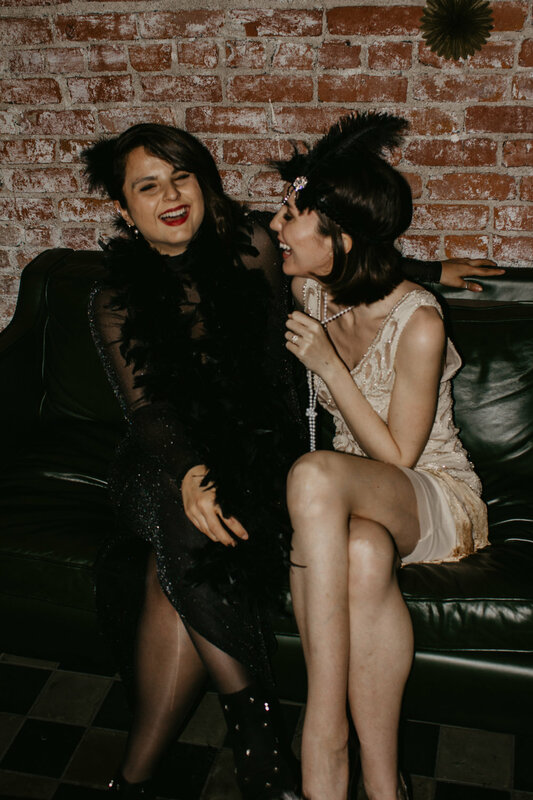 The game was called “Murder at the Gatsby Speakeasy” which fit our setting perfectly, though I wasn’t thrilled with the game. We ended up believing the wrong person to be the killer, because the game didn’t make it very clear! It was also hard to read the cue cards because they are such a small size. All in all, the game made it easy to mingle and have lots of laughs. The restaurant provided appetizers like roasted red pepper bruschetta, salmon socca flatbreads, and an aperitivo platter. 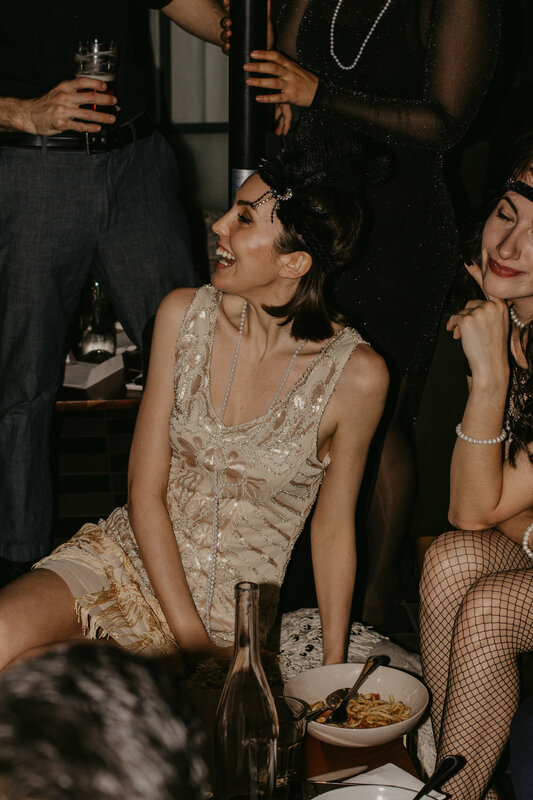 Within minutes, every guest had a custom crafted cocktail in hand, like a lillet gin and tonic or the la francaise, a passionfruit and grey goose cocktail. To see photos, visit my last blog post about dining at Massilia. It’s no secret that Massilia is my favorite place to dine in LA, not just because of the incredible food but for the ambience of the restaurant! From the first moment I visited, I was dying to host an event in one of their two private event spaces. The garden space on the patio was perfect! 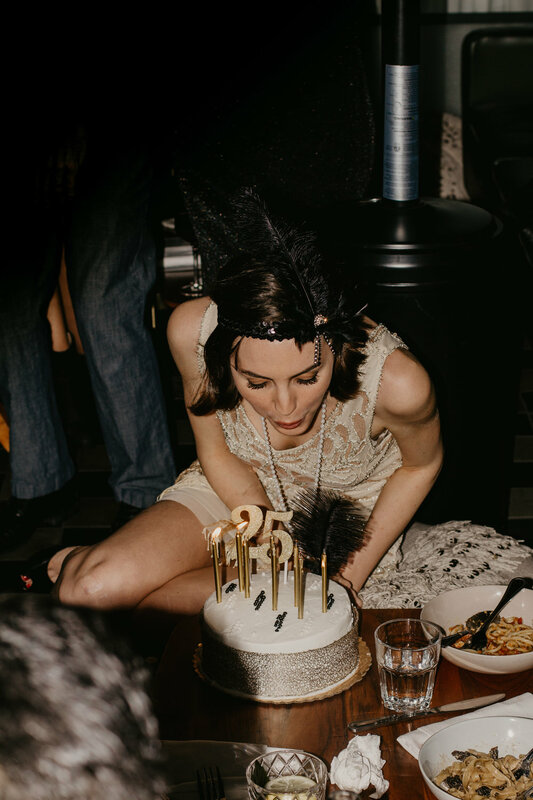 It had vintage elements with the ambiance of the 1920’s style chandelier and bar in the background. The space is flexible enough that you could host a variety of events here that feel classy, elevated, and comfortable. My bestie Hannah and I pulled off the cake ourselves! I ordered a basic white cake from the grocery store and we decorated it with a feathered hair clip, pearl candies from Michaels, and gold ribbon. The servers brought it out with candles lit, and then whisked it away to slice and serve it for my guests. That’s what I mean about incredible service! 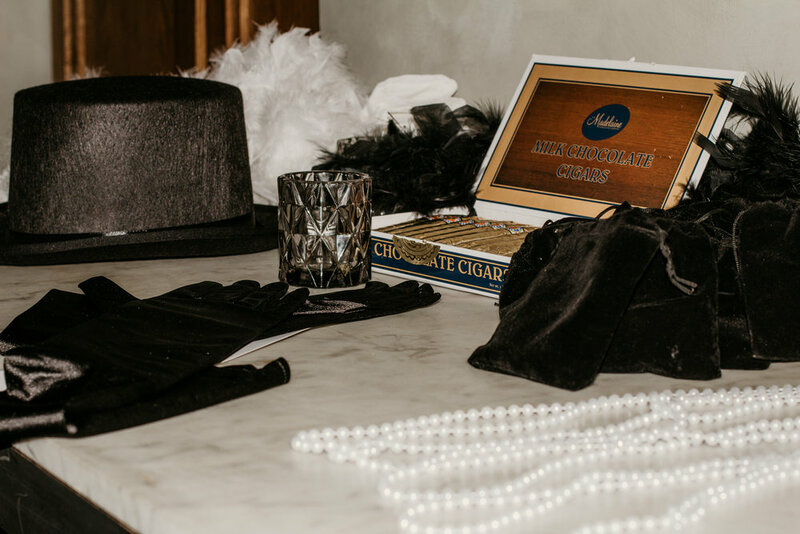 I set up a costume station with chocolate cigars, pearls, top hats, boas, gloves, headbands, and fun accessories. Our costumes came from Amazon and our accessories came from Party City. The night was a blast, and we had an incredible time. 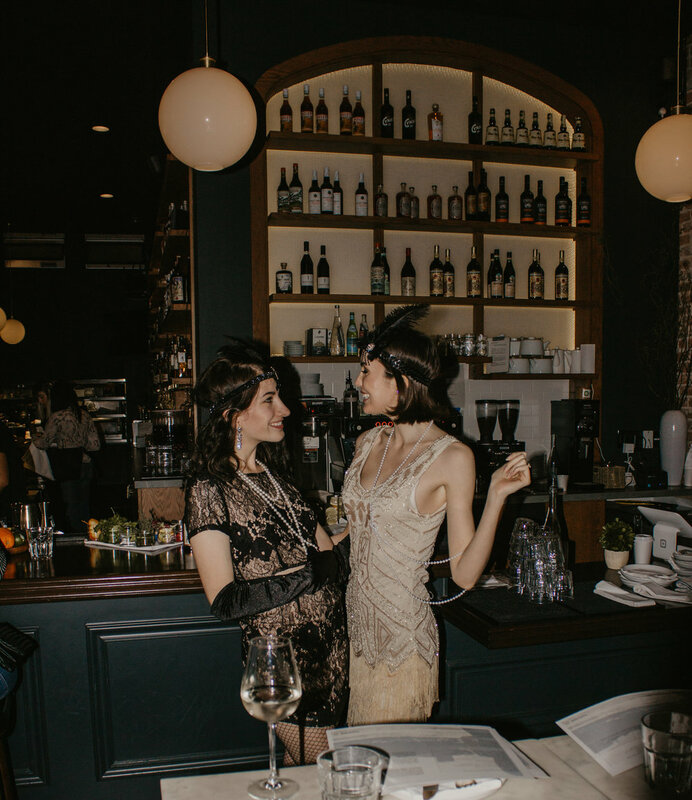 A huge thank you to Massilia restaurant for sponsoring the event, and Hannah Leigh Photography for taking photos.